In the 18th century, Stoke Newington became a fashionable area with well built houses, some of which can still be seen. 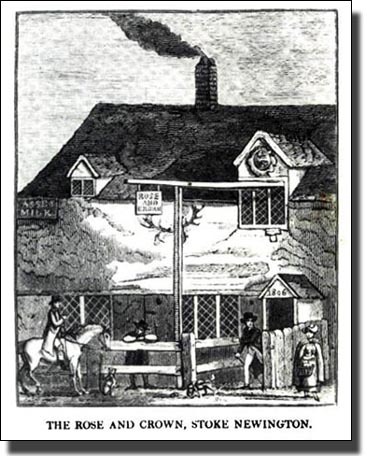 London had been rebuilt after the Fire in handsome brick and stone instead of its original wood and thatch so many merchants were happy to live there. Others preferred the fresh air of the country. They could ride to their warehouses in the City each day and yet leave their families in the country. The Plague was still fresh in their minds. 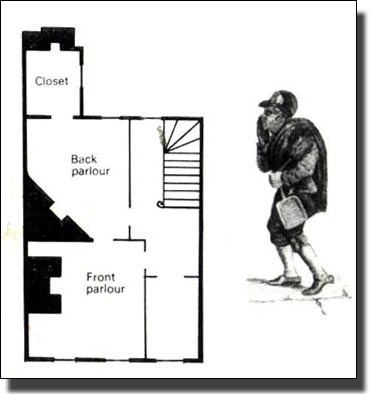 Those too, with different or Dissenting religious views, often preferred to live at a slight distance from Authority. An individual preacher could attract people to listen to him and later perhaps, come to live near his church. This happened in Stoke Newington. hidden behind shop fronts, while others have become factories, with sheds and outbuildings around them, but they can still be recognised. The original buildings are in red brick, made from the local Brickearth, have parapet roofs, rectangular windows with small panes of glass, window frames set back into the wall and elegant proportions. The John Rocque map shows these houses in their setting. A single, wandering street joined Stoke Newington High Street and Green Lanes. Everywhere else was fields with the New River a peaceful, meandering stream, open to the air and not hidden as it is today. There were houses on both sides of the road with large gardens. The Old St Mary's Church, only a third of its present size, had been built in the Middle Ages and improved in 1563, but was still tiny. There were a few houses on the other side of Stoke Newington High St to serve the traffic passing to and from London but otherwise, the area consisted of agricultural land. Lordship Lane had no houses but was part of a lane leading from Haringey, through Stoke Newington and down by Cut Throat Lane, to Kingsland. Some of this may have been a drovers' route, for taking cattle to Smithfield Market. 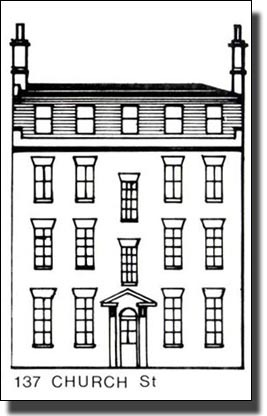 Ground Floor Plan of a typical early eighteenth-century terrace house. Notice the chimneys which are large enough for boys to climb.